Find Approaching Neverland In Barnes & Noble's Rising Star Special Collection this month! "I read this book in one weekend. Correction: I devoured it. I fell in love with this family and their triumphant and tragic stories. Approaching Neverland is beautifully written, and a genuine page-turner and emotional rollercoaster." Psych Central, Margarita Tartakovsky, M.S. "Approaching Neverland is a good book for reading, re-reading, and sharing with others because it is beautifully human...The family's strengths, vulnerabilities, tragedies, and joys will have the reader crying at the bottom of one page, smiling by the top of the next, then crying and smiling by the bottom again. Basically it will make you one hot mess, so if reading in public, keep a tissue handy." "Truly inspiring for anyone who has suffered tragedy or loss in their life." "A must read that will leave you smiling with tears in your eyes." "What we have here is a large slice of life, told with purpose...about conviction, redemption, and staying the course." For as long as she could remember, author Peggy Kennedy bore witness to her mother's Mental Illness: while growing up in the 1960s, Peggy's mother, Barbara, often liked to playgames of make-believe and tell the children they were all going to Neverland-just like Peter Pan. But while the children knew it was all pretend, Barbara believed it to be all too true. 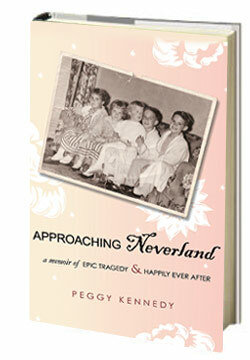 Approaching Neverland recounts Peggy and her family's attempts to deal with their mother's acute bipolar disorder during a time when it was little understood and even feared. With brutal honesty and surprising humor, Peggy shares the turbulence of growing up under the shadow of Barbara's illness, of being shuffled from one family member to the next, and of visiting her mother in the mental institution. As the years pass, the shadows of Barbara's mental health challenges become a loving legacy in Peggy's quest to achieve happiness and fulfillment in her life. A vivid, haunting portrayal of one woman's struggle to understand how the past fits in with her future,Approaching Neverland is as inspiring as it is beautifully written, and will stay with you long after the last page is turned.